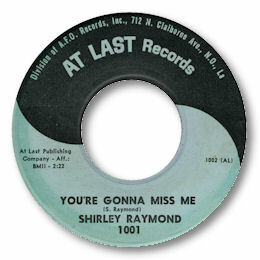 Another of those seemingly unending singers from New Orleans, Shirley Raymond only had this one 45 released. But in You’re Gonna Miss Me she shows enough grit and determination to warrant a lot more vinyl action. This super blues ballad is taken at a steady pace with the arrangement very well mixed showing off Shirley’s rough tough vocal. The flip is one of those Crescent City rhythmic numbers I love so much complete with bass voice interjections a la Ernie K-Doe’s “Mother In Law”. All in all a real quality single. At Last was a subsidiary of the AFO co-operative so the musicians would have included the great drummer John Boudreaux, Harold Battiste, Red Tyler and Nat Perrilliat on sax, Roy Montrell on guitar, either Dr John or James Booker on keyboards and the wonderful trumpeter Melvin Lasite. No wonder they sound so good.